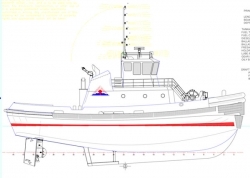 The new HAVs will feature Caterpillar Marine’s stem-to-stern hybrid propulsion system, which includes twin Cat 3512E main engines, each producing 2,550hp at 1,800rpm, two C18 generator sets, sparking 565kW of electrical power, a C7.1 generator set, producing 200kW of electrical power, shaft lines, MTA 628 azimuth drives with Cu-Ni-Al bronze 2,800mm propellers and water-cooled thruster motors. The system also includes the switchgear, variable-frequency drives (VFD) and a fully integrated control system. The main engines power the main thrusters via a shaft line. Between the main engine and the thruster there is a main clutch mounted in a bell housing attached to the engine. On the back end of each thruster there is a thruster motor operated by a VFD controller. The system has four main operational modes: electric, diesel, hybrid and FiFi (firefighting), whereby the firefighting pump is powered from the front of starboard main engine power take-off (PTO). The vessel will have three main deck lanes, for a capacity of 23 cars or a mix of cars and trucks, as well as 250 passengers and accommodation for six crew members. The vessels are scheduled to be delivered in Q4 2018 and Q1 2019 respectively.